By Mark - Ecuador - 15 Jan/03 - Viewed 1893 times. Once we got to Baltra Airport in the Galapagos we made our way to Puerto Ayora on Isla Santa Cruz (by bus, ferry then bus again). There we checked into Hostel Espa�a - only US$4.00 each with bathroom. The only drawback is that the builders start work at 7am each morning. Next we spent a couple of hours waiting in the bank to get the money to pay for our diving course. There is only one bank on the island and they charge an outrageous 4% for visa advances. We booked our PADI Open Water diving course with Nauti Diving. We couldn't start for a few days but they gave us the books so we could start learning the theory. We also walked to Tortuga Bay, a beautiful beach 40 minutes away. It has white sand, turquoise water and hardly any people. There were pelicans diving into the water fishing, sometimes only a few feet away from where we were swimming. They are suprisingly big and look like something from Jurassic Park when they are flying. 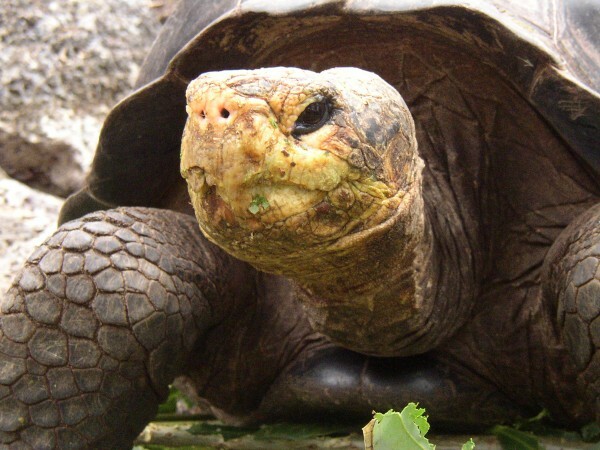 We also went to the Charles Darwin Research Centre where you can see giant tortoises and land iguanas. When we started our diving, another person (an Italian guy) had signed up so it only cost US$250.00 instead of US$300.00 each. The first day the English instructor, Roland, showed us all the equipment and then took us to the nearby beach. There were marine iguanas climbing on the rocks. There we put everything on and tried to walk into the water without falling over. We were further hampered by all the children which kept trying to hang onto us. We went out to where it was about 2 meters deep and went underwater. First we practised breathing and then taking the regulator out underwater and putting it back on. Then the same with the mask. Then we repeated the exercises in about 3 meters of water. We spent about 2 hours doing various exercises and that was it for the day. Day two was down the beach again in only slightly deeper water. It was Monday so no children today. There were lots of things to practice, like swimming without the mask, controlling bouyancy, using someone elses spare regulator if yours runs out of air etc. We also had to prove we could swim for 200 metres and tread water for 10 minutes. The next day we were up early to go out on the boat. You have to do four open water dives - two each day. We went out into the bay and got into the water. I was a bit worried that the instructor wanted us to roll backwards off the side of the boat, but that turned out to be easy. We started to decend the 10m to the seabed down the boat anchor line but Laura was having a problem equalising her ears so she had to go back to the boat. We repeated the exercises from before and went back to the boat after an hour. A bit of a rest and then we went back in for the second dive. Laura stayed on the boat. The second dive we got to swim around a bit and look at the fish. We saw an eagle ray and a white tip reef shark. Back on land, Laura went to the diving doctor. He charges US$25.00 just to get in the door, but you do get to have a look at the recompression chamber. He said she had an ear infection and prescribed the most expensive antibiotics money can buy. And she couldn't dive for five days. We decided that I would finish the course now and she would complete it when we got back from our boat tour. That afternoon Roland showed us how to calculate how long you can stay underwater for at different depths using dive tables. The following day I went out on the boat for the last day of the course. The first dive was exercises - more complicated ones like two people breathing from one regulator and an emergency ascent to the surface without breathing. We also had to take off all our equipment and put it back on, both underwater and at the surface. This all went okay for me but the other guy on the course wasn't getting on so well. He kept forgetting to inflate his jacket on the surface so he wasn't floating and when he tried to get back in the boat he would take his jacket off before his weights, so he immediately started sinking like a stone. The last dive was a sight seeing trip at a rocky outcrop called Loboria. This was amazing as there were lots of sea lions. They were very curious and swam all around us. They also blow bubbles at you because they see your bubbles. That afternoon we sat our written exam - fifty multiple choice questions of which you need 75% to pass. Laura sat it as well and we both passed.